Learn Market Online > Education > Technical analysis > Support and Resistance > How to trade with Support and Resistance? The resistance level of an asset is that level where the price tends to stop rising whereas the support level of an asset is that level where price tends to stop falling. Despite how simple this definition sounds, you will be surprised at how fast your trading account can get depleted when making start support and resistance trading based on this simple definition. In order to effectively use support and resistance levels, we must first try to understand how prices of assets move in order to effectively make correct interpretation of support and resistance levels from that framework. There are different types of support and resistance levels. Amongst them are minor and major (strong). Its expected for minor levels to break whilst major levels are expected to hold and cause the price action to move in the opposite direction. 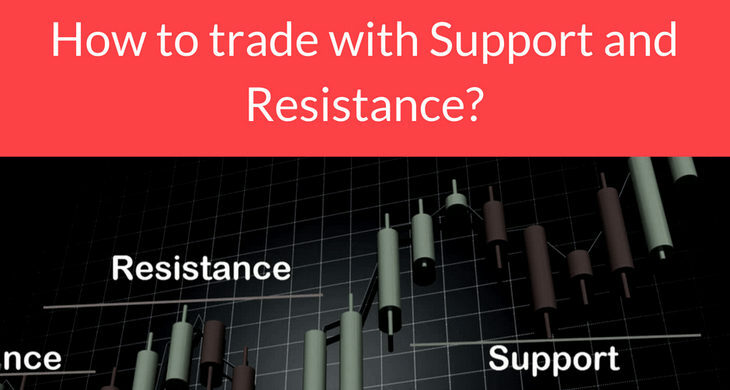 How to trade using support and resistance levels. The support and resistance are marked with horizontal or angled lines which are called trendlines. If the price action delays and reverses in the same price area on two different occasions in consecutive successions, then a horizontal line is drawn to give an indication that the market is struggling to move past designated area. Prices make higher highs and higher lows in upward trends. In contrast, prices make lower lows and lower highs in downtrends. Connect the highs and lows that occur during a trend. Then make an extension of the line to the right side to know areas where potential support and resistance could be found in the future. The simple lines you see are used to highlight trends, ranges and other patterns in the chart. The aid traders with a visual image of the direction in which the market is currently moving and what it could potentially look like in the future. As stated above, it is expected for minor resistance levels to break. For instance, if the price is trending low, it will continue in the low, bounce and then begin to drop back again. That low is marked as a minor support area because the price stalled out and bounced off that level. And since the trend is already down, the price action is most likely eventually fall through that minor support level without much hiccups. The minor resistance or support provides traders with analytical insight and potential trading opportunities. Using the example cited above, when the price action drops below the minor support level then we know the downtrend is still intact. When the price action delays and bounces to a level which is at or near the former low then a range is said to be developing. But if the price action delays and bounces back to a level which is above the former low then we have a higher low and that will be an indication for a potential change in trend. Major support and resistance are those price areas that have already created a recent reverse trend. If the price was previously trending higher and then reversed into a downtrend, where it originally reversed from, is termed a strong resistance level. Strong levels of support and resistance are usually represented by significant occasions of tests without breakouts, adding to the confidence the trend will reverse after facing that level. Such levels can be used as potential entry points for long-term positions, especially when combined with other tools like Fibonacci or RSI to confirm the resilience of the level. 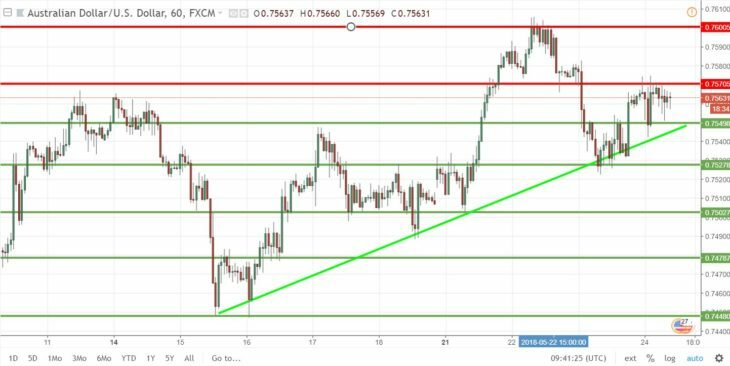 On the picture above of AUD/USD 1H price chart there are 7 levels of horizontal support and resistance and one major support trendline guarding current trend. Pay attention on the level of support market by number 5. This level has been successfully tested many times without a breakout and as such is likely to provide stringer support than those areas market by 3,4,6 and 7. There is no denying that price pierces through all areas of support and resistance regardless of complexity and resilience in the long-term but still those level which have “stood the test of time” are ore likely to give reliable entry points. When the price comes back to an area that was previously a major support or resistance area, it usually struggles to break through and come back in the opposite direction. For instance, if the price action falls to a strong support level, it usually bounces upward off it. It is possible for the price to eventually break through it, but it is very typical for the price action to retreat from that level a couple of times before breaking through. 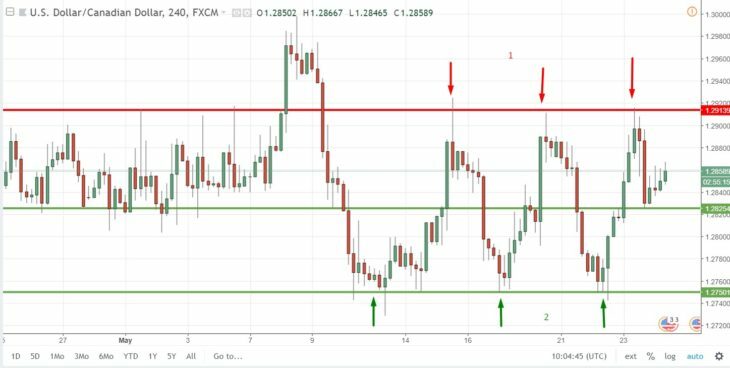 The most basic method for trading based on support and resistance level is to buy near the support level in uptrends, ranges or chart patterns and to sell close to resistance in downtrends, ranges and chart patterns. It makes it possible to isolate a longer-term trend, even when on a range or on chart pattern. The trend offers assistance on the best direction to it. For instance, when the trend is down but then a new range develops, you should give preference to selling at range resistance rather than buying at range support. The down-trend makes it possible for us to know that short has a better chance of making a profit than buying. If the trend is up and a triangle pattern develops, you should rather buy near support of the triangle pattern. Buying near support or selling near resistance can be worth it, but unfortunately, there can be no guarantee that the support or resistance will hold. As such, you should consider waiting for some form of confirmation that proves that the market is still respecting that area. When making purchase near the support line, wait for a consolidation in the support area, and then only buy when the price breaks above the high of the small consolidated area. One way to know that the market is respecting the area is when the price makes a move like this. It also makes us know that the price is beginning to move higher off the support. The same concept is applied when selling at resistance. You wait for a consolidated area that is near the resistance area, then only make a short trade when the price drops below the low of the small consolidation. For example, on the picture above of the USD/CAD (US dollar/Canadian Dollar) currency pair we have market 2 areas . Area 1 is representing strong resistance and area 2 is an area of strong support. As you can see, both levels were tested several times without a breakout. The green line in the middle was a strong support in the past as can be seen on the picture but the level seems to have lost is validity having been broken several times within the consistence of triple top pattern. You should always have a target price at which you will exit a trade in mind when entering a trade. Consider exiting just before the price action reaches a strong resistance level when buying near support. You should consider exiting just before the price action reaches the strong support when shorting at resistance. For instance, consider selling at the top of the channel when buying at support in a rising trend channel. It is also possible to get out with more profit in some cases if you lets a breakout occur. For instance, you may wish to hold the trade until it breaks through the triangle resistance and continues with the upwards trend when buying near triangle support within a bigger trend. In any case, additional tools are required for confirmation. There is also a concept that it is possible for old support to become new resistance or vice versa. This is one of the most significant and shattered rules that you should remember when dealing with support and resistance. Prices of assets most at times move slightly than we expect them to. This does not occur very often, buy it happens, we term it a false breakout. For instance, if by our analysis, there is support at $10, it is very possible that the price could drop from $10 to 9.97 or $9.95 and then start to rally again. What you should understand is that support and resistance are areas and not exact price. As such you should expect the price action is likely to vary around support and resistance. It is also possible to that it will stop at the exact price as before. False breakouts always present immaculate trading opportunities. One strategy you can employ is to wait for the false breakout and then enter the market after it has occurred. For instance, if the trend happens to be up and the price begins to pull back to support, you should wait for the price to break below support and then buy when the price begins to rally back above support. In a similar fashion, when you observe that the trend is down and the price begins to pull back to resistance, wait for the price to break above resistance and then short-sell when the price starts to drop below resistance. The unfortunate thing about this strategy is that it does not always occur. As such if you insist on waiting for one before you trade, you will be missing other countless trading opportunities. Therefore, it is best to take advantage of trading opportunities as they come. Mark the major support and resistance areas on your chart, as they could most likely become important to you in the future if the price approaches those areas. But delete them once you realize that they are no longer relevant. You should also mark the current and important minor support and resistance levels on your chart as these can assist you in analyzing the current trends, ranges and chart patterns. Unfortunately, these minor support and resistance levels lose their importance pretty quickly as new ones always emerge. Keep drawing current minor support and resistance levels and deleting the old ones.